Adams, Britt; Schellens, Tammy; Valcke, Martin;. Promoting Adolescents' Moral Advertising Literacy in Secondary Education COMUNICAR , 2017. Aguaded, Ignacio; Cabero Almenara, Julio;. Progress and challenges in promoting educational innovation with emerging and interactive technologies EDUCAR , 2014. Aguaded-Gomez, Ignacio; Tirado-Morueta, Ramon; Hernando-Gomez, Angel;. Media competence in adult citizens in Andalusia, Spain INFORMATION COMMUNICATION & SOCIETY , 2015. Bonilla del Rio, Monica; Garcia-Ruiz, Rosa; Perez Rodriguez, M. Amor;. Edu-communication as a challenge for inclusive education EDMETIC , 2018. Garcia-Ruiz, Rosa; Aguaded Gomez, J. Ignacio; Rodriguez Vazquez, Ana Isabel;. PROPOSAL MEDIA LITERACY FOR GENDER STEREOTYPES IN THE MEDIA Results and evaluation of the virtual chat room PRISMA SOCIAL , 2014. Garcia-Ruiz, Rosa; Rivera-Rogel, Diana;. 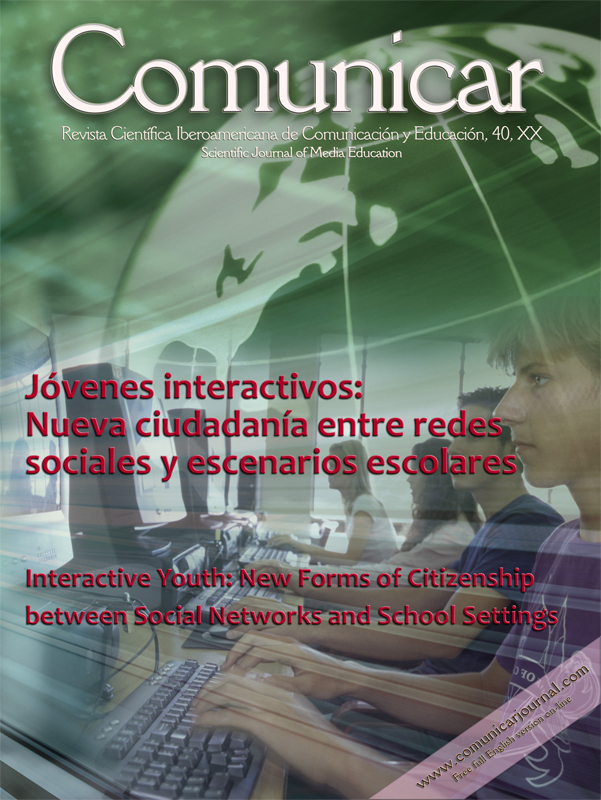 Media competence before the Agenda Setting: parameters of action at the educational level CHASQUI-REVISTA LATINOAMERICANA DE COMUNICACION , 2013. Garcia-Ruiz, Rosa; Sandoval, Yamile; Ahumada, Cesar de Cos;. The media literacy in professional training. Inclusion porpoise EDMETIC , 2013. Gonzalez Fernandez, Natalia; Gozalvez Perez, Vicent; Ramirez Garcia, Antonia;. The media competence in the non-university teachers. Diagnostic and training proposals REVISTA DE EDUCACION , 2015. Gozalvez Perez, Vicent; Contreras-Pulido, Paloma;. Empowering Media Citizenship through Educommunication COMUNICAR , 2014. Marín Gutiérrez, Isidro; Rivera Rogel, Diana; Celly Alvarado, Stephany;. Cuadernos.info , 2014. Moya Jorge; Tamara;. Towards a film literacy canon: identification and multicultural analysis of the contents used in film education with pre-university students in Spain COMMUNICATION & SOCIETY-SPAIN , 2019. Pineiro Castro; Jose;. BROWSER: A SOURCE FOR RESEARCH. 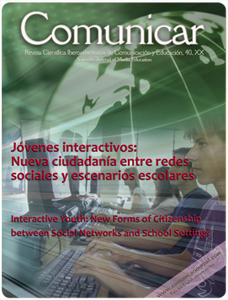 HOW CHILDREN USE INTERNET PIXEL-BIT- REVISTA DE MEDIOS Y EDUCACION , 2014. Rey, Juan; Hernandez-Santaolalla, Victor; Silva-Vera, Francisco;. Media literacy and advertising discourse in three schools in Guayaquil CONVERGENCIA-REVISTA DE CIENCIAS SOCIALES , 2017. Rivera Rogel, Diana Elizabeth; Carrion Salinas, Gianella Alejandra; Rocha, A;. Ecuadorian media literacy in adolescents Case study Loja and Zamora 2016 11TH IBERIAN CONFERENCE ON INFORMATION SYSTEMS AND TECHNOLOGIES (CISTI) , 2016. Rosser-Liminana, Ana; Jareno-Ruiz, Diana; Lopez-Sanchez, Carmen;. Mobile application as an educommunication strategy to eliminate physical punishment in children. The case of Hands up REVISTA MEDITERRANEA COMUNICACION-JOURNAL OF COMMUNICATION , 2018. Ugalde, Leire; Martinez-de-Morentin, Juan-Ignacio; Medrano, Maria-Concepcion;. Adolescents' TV Viewing Patterns in the Digital Era: a Cross-cultural Study COMUNICAR , 2017. Adams, B., Schellens, T., Valcke, M.. Promoting adolescents' moral advertising literacy in secondary education), Comunicar, 2017. Aguaded-Gómez, I., Tirado-Morueta, R., Hernando-Gómez, Á.. Media competence in adult citizens in Andalusia, Spain), Information Communication and Society, 2015. García-Ruiz, R., Gómez, J.I.A., Rodríguez Vázquez, A.I.. Proposal media literacy for gender stereotypes in the media: Results and evaluation of the virtual chat room Faces of Women" | Propuesta de alfabetización mediática ante los estereotipos de género en los medios de comunicación: Resultados y valoración de), Prisma Social, 2014. González Fernández, N., Gozálvez Pérez, V., Ramírez García, A.. Media competence of non-university teachers. Diagnosis and training proposals | La competencia mediática en el profesorado no universitario. diagnóstico y propuestas formatives), Revista de Educacion, 2015. Gozálvez, V., Contreras-Pulido, P.. Empowering media citizenship through educommunication), Comunicar, 2014. Llorent-Bedmar, V., Cobano-Delgado Palma, V.. The role of the digital press to the integration of immigrants: Zeit Online y The Times Online | La prensa digital ante la integración de los inmigrantes. Los casos del Zeit Online y The Times Online), Estudios Sobre el Mensaje Periodistico, 2015. Reis, L.P., Faria, B.M., Goncalves, J., Rocha, A., Carvalho, V.. QVida+: Quality of life continuos estimation for clinical decision support | QVIDA+: Estimação Contínua de Qualidade de Vida para Auxílio Eficaz à Decisão Clínica), Iberian Conference on Information Systems and Technologies, CISTI, 2016. Torrales-Aguirre, D., Aguaded-Gómez, J.I., Ponce-Guardiola, D.. IP-TV in the University: A challenge popular science television for young Chileans | La TV por IP en la Universidad: Un reto de divulgación científica televisiva para jóvenes chilenos), Estudios Sobre el Mensaje Periodistico, 2014. Torrales-Aguirre, D., Aguaded-Gómez, J.I., Ponce-Guardiola, D.. IPTV in the University: A challenge popular science television for young Chileans | La TV por IP en la Universidad: Un reto de divulgación científica televisiva para jóvenes chilenos), Estudios Sobre el Mensaje Periodistico, 2014. Ugalde, L., Martínez-de-Morentin, J.-I., Medrano, M.-C.. Adolescents' Tv viewing patterns in the digital era: A cross-cultural study), Comunicar, 2017. Aguaded-Gómez, I., Tirado-Morueta, R., Hernando-Gómez, �. (2015). Media competence in adult citizens in Andalusia, Spain, Information, Communication & Society, 18(6).